A sloper is not necessary for Fitography, we offer it to help correct other companies’ patterns, or to draft your own. Because it uses Fitography® technology, it will fit on the 1st try. Can be fit symmetrical or asymmetrical. Knee length. Jewel neckline. CF seam. Bust, hip and elbow clearly marked. Back shoulder and waist darts. 2 darts on each side of both front and back skirt. Waist darts and bust darts on front bodice. Fran Haselden said: Amazing fit! I have had problems getting a perfect fit for such a long time. I've never been able to get a sloper that works for me. I have narrow shoulders and a short torso, but also am fully busted and large around the hips. All in quite difficult to fit! The first make of the sloper was closer than any fit I've tried before. Amazing! I ended up working through quite a few different tries to get it as perfect as possible. I used the outline service and was able to get it tweaked to make a few changes here and there. All-in-all, one of the best things I've purchased sewing-wise for the last few years. If you're considering, go for it. It's the best fit from a sloper you'll ever get and with minimum effort. Previous to this muslin, I had sewn another muslin. From that I learned I had two problems: 1. the sleeve was way to tight; 2. 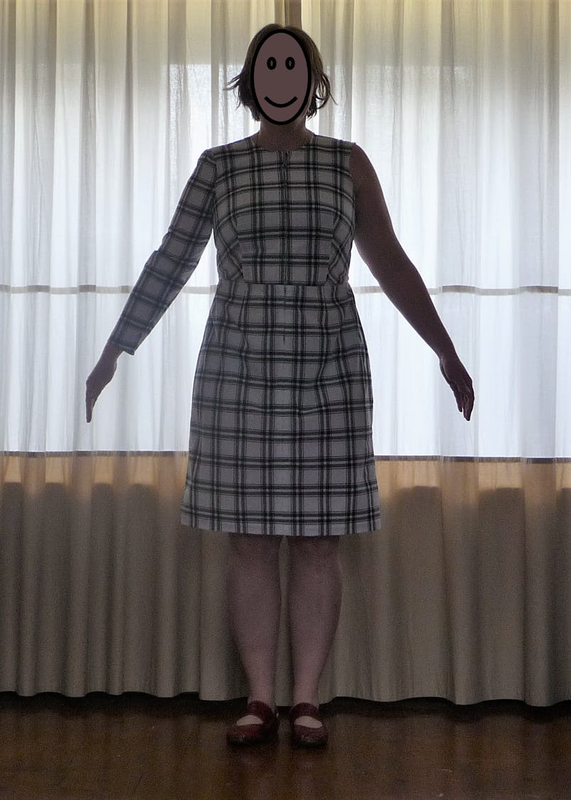 I was standing in a weird manner in the pictures I took voor the outline, so this off course distorted the pattern pieces. I received feedback on how to adjust the sleeve width by both slightly chaningin my outline, and secondly adding more sleeve ease. To make sure my sloper would be more accurate, I took new pictures. As you can see, the posture in the screenshot and me in the dress are very similar!!!! (big smile). So what I learned from this, pay really close attention to your posture while taking pictures. Apparently my posture was very different while taking pictures, than in normal life. The sloper is drafted well, all pieces fit together exactly. Because I used a plaid, you can clearly see that the sloper hangs straight, and perpendicular to the floor. The bodice fits excellent, with the exception of the armhole/ sleeve. The sleeve as pictured has 4 cm wearing ease (when drafting the pattern piece) but it is still really tight in reality. I will need to make some more changes, you can see how it creates draglines on top of the bust. The armhole is maybe a bit tight, I cut awayt the seam allowance, and staytaped the edge, so wat you see in the picture is the location of where the sticht line would be. The skirt however is very loose. 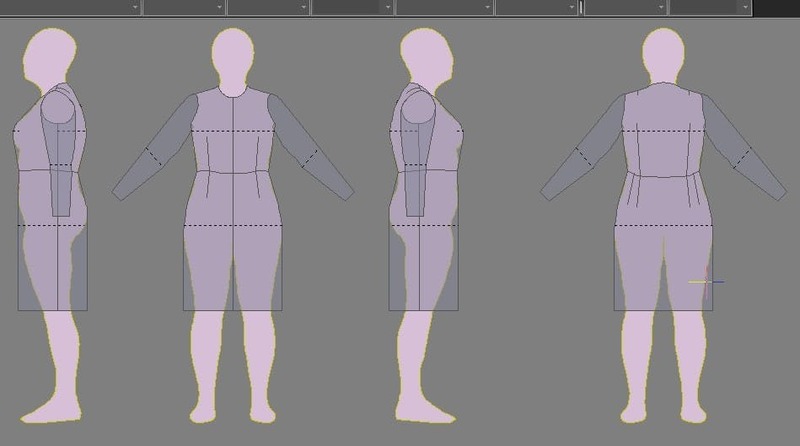 There is much more ease than displayed in the screenshot, and it is much more than the default setting of 2.54 cm I used when drafting the pattern. I will need to further investigate what is causing this problem. Even when sitting down, there is a lot of excess fabric. The final result fits much better than any pattern before, it feels really comfortable. So eventhough there are still some fitting issues, I highly recommend this fitography and the sloper. I have tried other sloper patterns/ fitting system, but never achieved this great a fit! It is true, it feels realy comfortable. 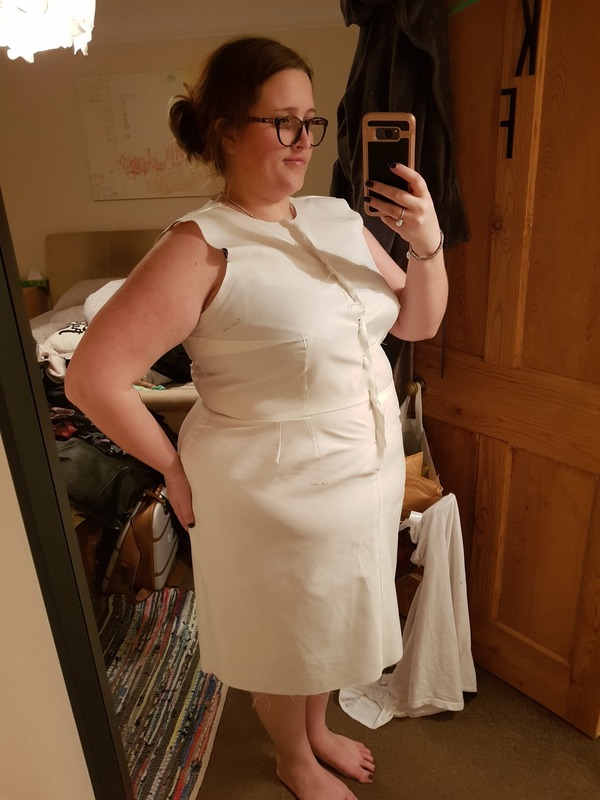 Thanks for your review SewFitted! The reason the hip circumference of your pattern is not the same as the hip circumference of your body plus wearing ease is that Fitography fills in the hollows of your body. If you see the side view of your body outline with the sloper drawing, you are hollow in front at the dashed line, which should be your hip line. For Fitography, the hip line should be at the fullest point of your bum regardless of your shape, so your hip placement is not quite in the right place which may be throwing off the pattern draft. Please note that improvements have been made to the first sloper pattern this is a review of the Sloper v3. I sewed my muslin exactly as per the pattern with no adjustments at all and left all the default settings as-is. It fits very well. What the photos don’t show is how comfortable the sloper feels. There is no tugging or pulling at the sleeves or shoulders and the garment doesn’t move around or slip forward or back. 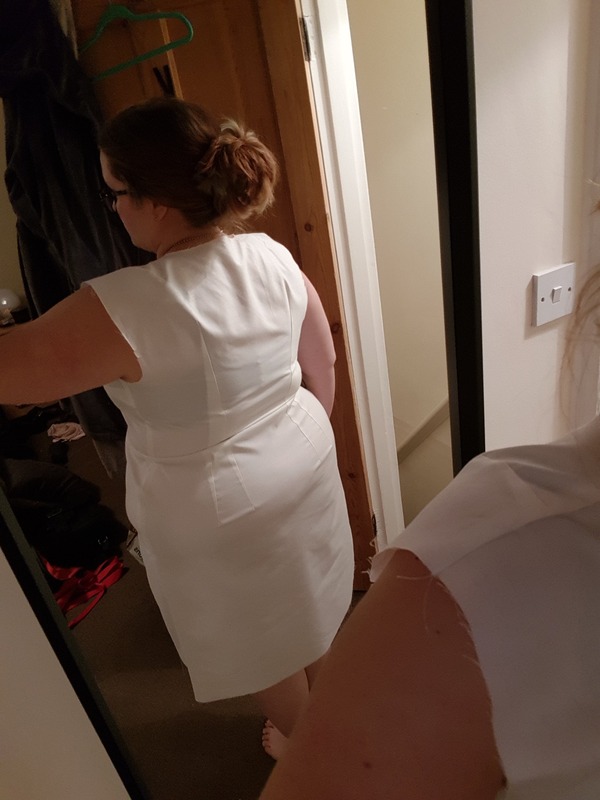 I lowered my waist on my outline because I am very short-waisted and don’t like to accentuate this but based on my muslin I will edit my outline to place it closer to my natural waist. I also have some drag lines from my bust and these are caused by my body requiring very angled side seams – especially on one side. 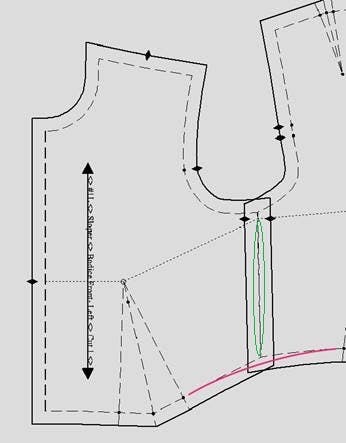 It was recommended that I sew the waist seam as shown in red in the attached picture to improve this. I re-sewed the waist seam as suggested and I also shaped the side seams (shown in green) to closer match my shape since I am narrowest just below my bust and had some excess fabric here since all dart and bodice side seams are drafted as straight lines. The set of pictures of the bodice shows the altered muslin and these 2 small changes have completely removed the draglines. Some of the wrinkles (front and back) are just a function of my asymmetry and I am happy to live with these since I don’t stand still all day long wearing a dress made of flimsy polyester! I think this is a great pattern to make sure your outline is just right before launching into some of the other patterns and might also help you solve some of your own fit mysteries - especially if you are asymmetrical.